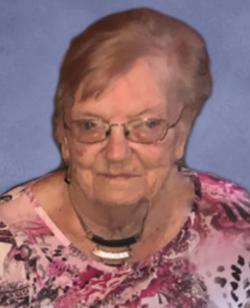 Helen Eva Locke, 94 of Sackville N.B., while surrounded by her loving family, went to be with her Lord on Saturday March 30, 2019. Born in Jolicure, N.B. on January 20,1925, she was the daughter of Bert and Eva (Patterson) Read. Helen was a devoted Christian, wife, mother, grandmother and great grandmother. She enjoyed life especially hosting the family Christmas's, many years spent at the cottage, swimming, bowling and watching curling and an avid Blue Jays fan. Helen will be sadly missed by her daughters Marlene of Mt. Whatley, Ruth Lirette (Ricky) of Sackville, sons David (Linda) of Pte de Bute, Philip (Diane) and Gordon (Beth) both of Moncton, daughter-in-law Darlene Locke, Summerside, PEI; 11 grandchildren, Rhonda, Tanya, Chris, Kelly, Jessica, Erin, Trent, Michael, Nancy, Becky, Nick, 11 great grandchildren, Brayden, Maya, Avery, Landon, Brooklyn, Callan, Makaela, Bronson, Dawson, Skye and Ava; 3 nieces and nephews Dennis, Kathy and Joan. In addition to her parents, Helen was predeceased by her husband Roger, son Allan and brother Lester. Arrangements have been entrusted to Jones Funeral Home, 70 Bridge St., Sackville, NB (506-364-1300) where visiting hours will be held on Wednesday, April 3, 2019 from 2 to 4 and 6 to 8 pm. A funeral service to celebrate and honour Helen's Life will be held on Thursday, April 4, 2019 at 2 pm, Pastor Morris Mills officiating. Burial will take place in the Sackville Cemetery in the spring. Those wishing to make a donation in Helen's name may do so to the charity of your choice. Sharing of memories, and condolences, may be sent to the family by visiting Helen's online memorial at www.jonesfuneralhome.ca or through the Jones Funeral Home Facebook Page.